Robert Capa had made a name for himself as a war photographer that had covered the Spanish civil war and the Second Sino-Japanese War. To escape the Nazi’s he moved to New York where he became a photographer for the Allies. On D-Day June 6, 1944 the Allies started their much anticipated invasion of mainland Europe. Hitting the beaches with American troops Capa, while dodging intense German fire, was able to take 106 pictures before returning to London to develop his photos. Unfortunately an incident in the London photo development labs caused all but 11 of his 106 pictures to be destroyed. 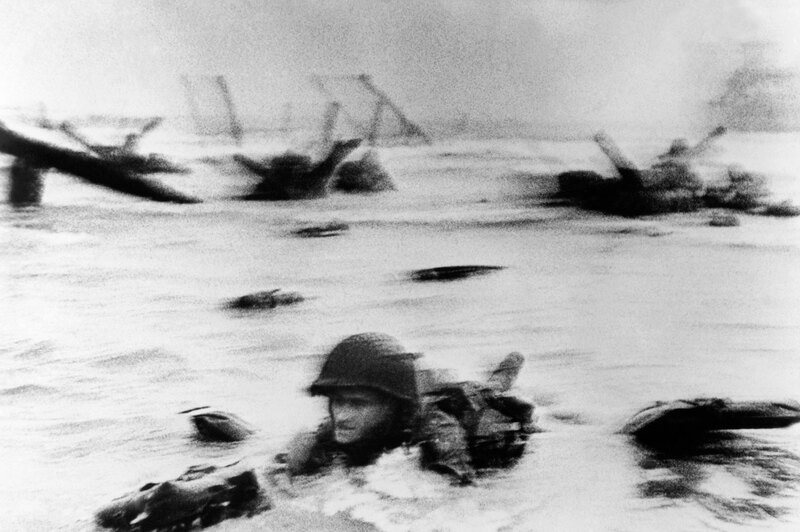 This shot of a soldier in the water is considered the best and shows the true nature of the Normandy invasion. Steven Spielberg was so inspired by this shot that for the Saving Private Ryan movie he tried to duplicate the conditions shown in the photo.